Motorola introduced its new model mobile phone. Shortly after launching as an expensive status symbol, Motorola fixed the price and turned the V3 into one of the best selling handsets for ever. In the years that followed there were countless revisions, colors and would-be successors that ultimately turned the once-hyped product line into a euphemism for obsolete technology introduced motorola. The Motorola DROID RAZR features top-of-the-line specs, and it somehow stuffs it all into one of the thinnest and lightest smartphone on the earth. At only 7.1 millimeters thin, this isn’t only the thinnest 4G LTE device in the earth, it’s one of the thinnest smartphones period. With a 1.2GHz dual-core TI OMAP processor, a 4.3-inch qHD Super AMOLED display, 1GB of RAM, an 8-megapixel camera with 1080p HD video capture, an LED flash, an HDMI-out port, noise cancellation capabilities, 16GB of built-in storage and a 16GB microSD card pre-installed, this phone is isn’t just competing with other Android devices, it’s crushing them. 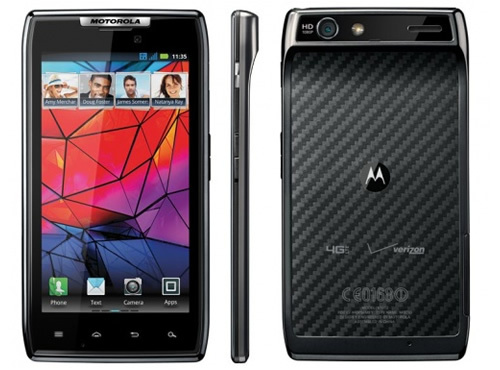 As far as the design of the handset, the DROID RAZR looks like the perfect evolution of the DROID family with a beautiful display sandwiched in between tough Gorilla Glass and a metal chassis with Kevlar backing. The edges of the RAZR are angular yet still soft, and the phone blends high gloss finishes with a matte case-back perfectly. On top of the phone is an HDMI-out port, a microUSB charging and data port, and a 3.5-millimeter headset jack. On the right side is a power on/off/unlock button next to a volume up/down rocker key. On the left side of the phone is a small cover that flips down to give you access to the phone’s LTE microSIM card and microSD card. Around back is the 8-megapixel camera, an LED flash and a good quality speaker.